A Tulsa family's world changed in an instant. A Holland Hall graduate, turned college athlete, is fighting for his life after collapsing during a workout. For days, his future looked grim, but the power of prayer has made all the difference. Slater Springman’s life has changed dramatically. Within the last month, the baseball player has been confined to a hospital bed in the intensive care unit. "We came to a really bad crisis where we thought we might lose him,” Rexann Springman, Slater’s mother said. A senior at Freed-Hardeman University in Henderson, Tennessee, Slater was conditioning with his baseball team. "He had only run seven laps when he collapsed,” Slater’s mother said. Slater’s teammates noticed something was not right. Their teammate was not sweating, and his eyes rolled back into his head. They immediately called an ambulance. "When they reached the hospital his core temperature was 105 degrees." Doctor’s said had Slater’s teammates not acted right away, he could have died. They are credited with saving his life. However, this would be the beginning of Slater's journey. Rexann Slater said she remembers the phone call from the hospital. Her face dropped. She rushed to Tennessee as fast as she could to be with her child who doctors said was in critical condition. "I said everybody just prays right now, we are really frightened,” Rexann said. Slater's health began to spiral. He was put in a medical coma and diagnosed with Rhabdomyolysis -- a condition where muscle fibers release their contents into the bloodstream. The athletes CPK (creatine phosphokinase) levels, or proteins that elicit chemical changes in the body, began to rise. "This number that is thrown off with the rhabdomyolysis is called CPK,” Rexann said. “Between you and I [the number] is usually 200." Slater’s levels, however, skyrocketed to nearly a million, and doctors weren't sure what to do. The Springman’s turned to the power of prayer. They posted Slater’s journey to Facebook and it spread like wildfire, giving the family comfort. Church groups across the country also began to pray. "I get cards from all around the world,” Rexann said. Slater’s hospital room in Tennessee was covered in getting well cards. 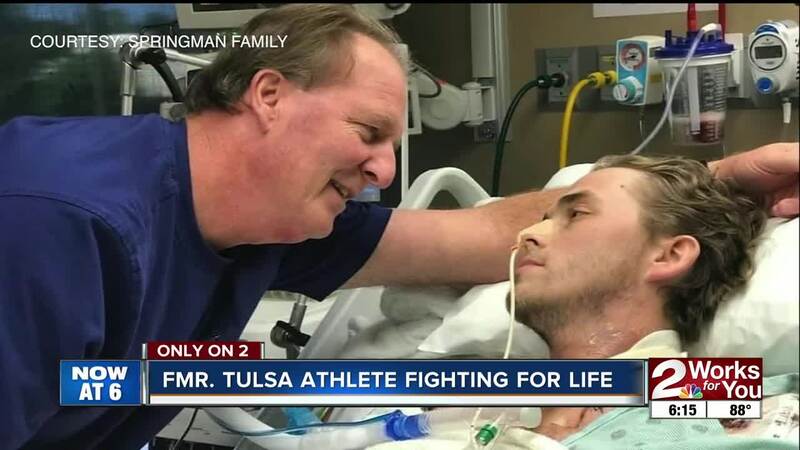 With every step forward, there were a couple steps back, but eventually, Slater’s body stabilized enough to be flown from his hospital in Tennessee to Tulsa. Thanks to the Angel MedFlight World Wide Air Ambulance, Slater was able to tow his hospital bed and monitors to Oklahoma. Slater is still recovering in the Intensive Care Unit. He’s slowly gaining back his strength and is able to communicate a little better. The Springman’s have high hopes and are hanging on to their faith. A mother and father's love for their son and for their savior is a testament to Slater’s fighting spirit. "He's 22, but he is still my baby,” Rexanne said. If you’d like to support Slater, you can visit the Freed-Hardeman website.